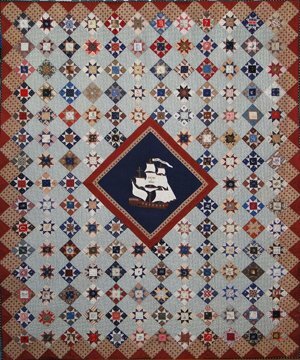 I was nearing the finishing point this past year and working on my Civil War Tribute Collection for the 150 years Anniversary, it occurred to me that I had indeed made a quilt to celebrate this Anniversary. Since my Quilt contains a lot of the prints I reproduced from the Civil War Era plus many I have not. It could have been made 150 years ago. This is intermediate to advanced pattern. I hand pieced all the stars. Kit includes box and complete instructions.